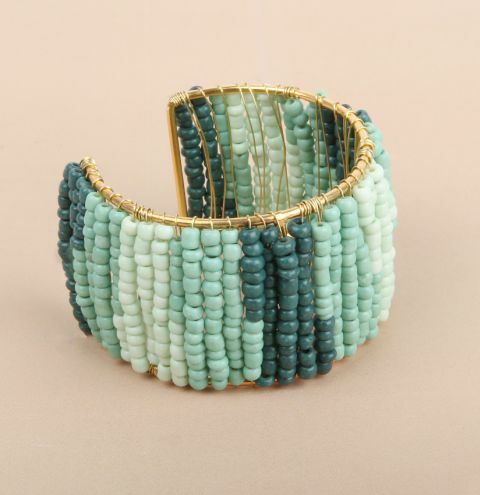 Make yourself a beautifully beaded bangle in trending green tones! Take a length of wire that you feel comfortable working with and approx. 5cm from the end wrap it around the top edge of the bagle base. Use your pliers to make a neat and tight wrap. Trim away the tail end and tuck it neatly next to the wrap. To make the ombré effect you will make 3 and a half rows of beads for each colour. With your wire coming from the outside of the bangle base, string on enough dark green beads to make one row. Pull the wire over the base so that the beads fill the first row. Bring the wire across the back of the bangle and over the top. Continue to add another 2 and a half rows of dark green beads before moving onto the mid-green and then the light green. Continue to add more rows until you reach the end of your bangle. To Attach a new piece of wire, secure it to the frame like you did at the beginning. Make sure all the loose ends are tucked neatly before wearing your bangle.